When It Comes to Born-Digital, How Well Do We Know Our Users? This post is the eighth in a bloggERS series about access to born-digital materials. What do we know about the needs, motivations, and experiences of users of born-digital archival materials? The archival profession has been processing and preserving born-digital collections for years, but as we begin to engage in more conversations about designing solutions for providing access to those materials, it seems we need to ask ourselves how much we actually know about what our users want. Or perhaps, how much we don’t know. In an era of user-centered design, what do archivists and their IT allies still need to learn about users of born-digital materials in order to engineer intuitive mechanisms for providing access to those collections? And how can we go about learning those unknowns? Can we gather data that might help anticipate future access needs or encourage more people to discover and reuse our born-digital materials? Rachael Dreyer, Head of Research Services for Special Collections at the Pennsylvania State University, and Katie Pierce Meyer, Humanities Librarian for Architecture & Planning at the University of Texas at Austin, documented the Team’s discussion as we identified our research questions and debated various strategies for our project proposal. In the months following SAA, the Team worked together to articulate and iterate over a proposal for a “Community-Wide Mixed-Methods Needs Assessment of Users of Born-Digital Archives.” We invite you to read and comment on our proposal, and to join us in implementing the ideas it outlines. and the publication of findings and next steps for improving born-digital access. The insights gained through the Needs Assessment would empower practitioners to design interfaces for access that are tailored to user needs, to communicate user needs more effectively to software developers, and to provide improved access services to users. The study would also provide opportunities for busy practitioners to participate in important research in a manageable but meaningful way, and for the community to work together to ensure that archives remain agile, relevant, and ready to meet the needs of 21st-century users. A website that would act as a hub for information about the project as well as results gathered from it. The website would provide access to project documentation and links to the research instruments, scrubbed data set, and reports (hosted in an open access repository). A web form to serve as the interview script and notes document (hosted by an IRB-certified service, such as a university’s instance of Qualtrics). An online survey (also hosted by an IRB-certified service). Interview and survey questions would be broad enough to apply to a wide variety of institutional contexts yet specific enough to gather useful data to describe user needs and experiences. They could be used before, during, or after accessing born-digital materials–this would be determined by the research team during the first six months of the project. Instructions and training materials for using the interview and survey instruments. Open access, (possibly peer-reviewed) published analysis of the results of the study, along with an anonymized version of the data set. The analysis could also include user personas and user stories created from the generalized data from the study. Project Leads: An IRB-certified research team, composed of a diverse group of approximately 10 individuals with varying expertise and from several different institutions (archivists, software developers, user experience designers, PhD students, etc.). Project Participants: Practitioners (ideally, at least 25) who opt-in to use the research instruments in their local institutions and contribute data to the project. Additional details about proposed timeline, budget, dissemination and preservation plans, and sustainability strategy are available (and ready for comment!) in the proposal. The Team hopes that results from the Needs Assessment would suggest next steps for improving born-digital access and could be cited in the future when archivists apply for further grant funding to expand access to born-digital materials. The research instruments could be revised for a second round of the study, which could be completed in approximately ten years, when many more archives will be providing access to born-digital materials. Results from the first and second rounds could be compared to track born-digital access over time. Want to help? Let’s do this. We are seeking volunteers for a team that can make this Needs Assessment a reality. Please feel welcome to comment on the proposal and contact me if you’re interested in getting involved (wendy [dot] hagenmaier [at] library [dot] gatech [dot] edu). Wendy Hagenmaier is the Digital Collections Archivist at the Georgia Tech Archives, where she develops policies and workflows for digital processing, preservation, and access. She received her M.S.I.S. with a focus on digital archives from the University of Texas at Austin. She is Vice President of the Society of Georgia Archivists, Chair of the SAA Issues and Advocacy Roundtable, and steering committee member for the SAA Electronic Records Section and Architectural Records Roundtable. This post is the seventh in a bloggERS series about access to born-digital materials. As a digital archivist, I am always looking for ways to streamline my processing workflows. Because, when faced with a multi-gigabyte hard drive or pile of aging 3.5” floppy disks, time is rarely on my side. The diverse nature of our collections, however, can be a hindrance when trying to build workflows based on efficiency—in spite of our best efforts, there are frequently cases where a collection’s particular characteristics demand greater levels of resources and time. During the past year, archivists at the Stuart A. Rose Manuscript, Archives, and Rare Book Library have developed a tiered approach to processing and access designed to flex in response to a collection’s limitations without obscuring its salient characteristics. Quality of data, defined by us as the totality, scope, and viability of the acquired material. Our focus here is on the completeness of the acquisition (an entire hard drive, for example, provides more content and context than a directory of files), the number of years spanned, and the extent to which data can be rendered using modern software. Authenticity of data, which refers to our ability to establish that it was indeed the donor that created, used, or managed the digital content. The number of donor restrictions and any concern regarding intellectual property rights. The extent to which we anticipate particularly high levels of use. Crucially, we want to avoid postponing questions about access until processing is complete, instead evaluating expected use up front so that access will inform processing from the very start. Collections assigned to this tier will primarily include familiar, homogenous file formats and will have few donor restrictions or intellectual property rights concerns. The limited complexity of the data will allow for largely tool-driven processing. Collections assigned to this tier will primarily include familiar file formats, although there may be instances of more challenging file formats. Some donor restrictions may apply. Collections assigned to this tier will include a large number of heterogeneous and challenging file formats. There may be a high level of donor restrictions. The scope of the collection and anticipated high levels of use may demand a more involved approach to arrangement, description, and access. Information in the three left-hand columns provides a broad assessment of the collection’s born-digital material based on our four criteria. This assessment is then used to determine that material should be processed as a tier three collection, meaning that it is a complex collection and will likely require high manual effort during processing. At the same time, our assessment guides decision-making about access. 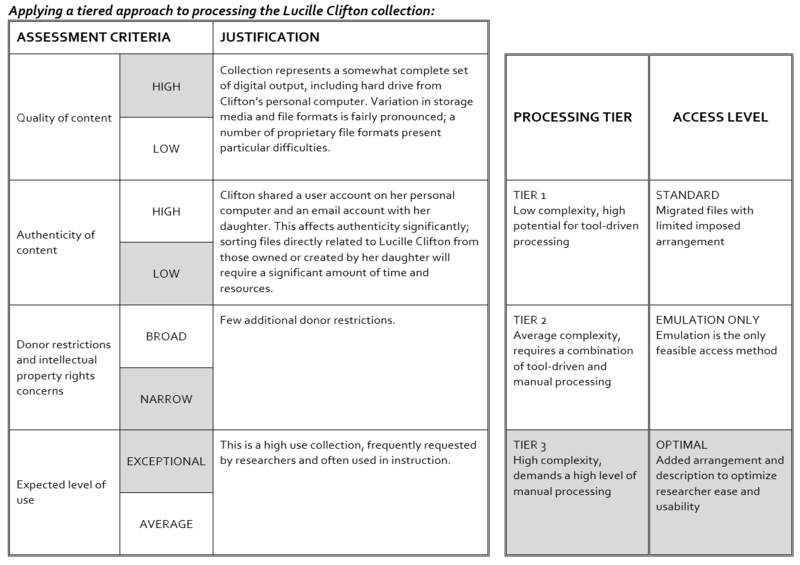 We’ve very loosely labelled the three levels at which we make collections available to researchers as standard, emulation only, and optimal—although it is important to note that we define these levels based not only on what we are currently able to do but also on what we hope to be able to implement in the future. As a result, consideration of these levels is as much about processing in such a way that does not preclude improved future models of access as it is about providing access right now. So, while optimal is perhaps more “optimal” as it currently stands, these are collections that we have deemed good candidates for a more advanced access point once we have the necessary resources in place. We determined, based on our assessment, that the Lucille Clifton collection warranted an “optimal” approach to access. Rather than automating our decision making, the initial assessment and subsequent assignment of a processing tier and access level provides a structured vocabulary by which recurring project considerations can be discussed, and a comprehensive rubric by which new projects can be prioritized and planned. Once identified, these tiers influence decision making at almost every stage of our born-digital workflows, including how processed collections are made available to our researchers. As we continue to apply this approach, we hope too to better track our work in order to more accurately allocate the time and resources required to process a collection at each tier. Note: This blog post borrows in part from a forthcoming article, “Flexible Processing and Diverse Collections: A Tiered Approach to Delivering Born Digital Archives,” written in collaboration by Dorothy Waugh, Elizabeth Roke, and Erika Farr, to be published in the journal Archives and Records. The article will offer additional information on how the tiered approach described in this post has been applied in practice at Emory. Dorothy Waugh is Digital Archivist at the Stuart A. Rose Manuscript, Archives, and Rare Book Library at Emory University, where she is responsible for the management of born-digital manuscript and archival material. This post is the sixth in a bloggERS series about access to born-digital materials. The Richard B. Russell Library for Political Research and Studies at the University of Georgia has been providing access to digital archives for about a year and a half. We needed something that was free, web-based (for broader access), and integrated with our existing workflows for paper (to keep it simpler). We ended up using our finding aids for description, our existing circulation system (Aeon) to track requests, and Google Drive to provide access to files. Researchers learn about digital files through our finding aids. If there is a series with related papers, we list the digital files at the end of that series. We are trying to balance the need to keep things together intellectually (rather than having a separate “electronic records” series) without taking on the labor-intensive work of integrating the folder list for papers and for digital files. Container list from the Davison Papers, showing description of digital files. Digital files are described in the aggregate, not at the item level. For instance, when describing files from a server, only the first 1-2 levels of folders are included in the finding aid. In addition to being a time-saving measure, it makes the finding aid more usable. Researchers get an overview of what the collection contains rather than an overwhelmingly-long list of filenames. When folder titles are insufficient for description, we will add a scope/content note for the folder and/or link to a directory print of the contents of the folder. For examples, see the Eric Johnson Papers or the Eleanor Smith Papers. The process for providing access to digital files is summarized below and described in more detail in our access policy. This policy will soon be updated to reflect changes in how we use Google Drive. The researcher requests digital files from the finding aid, just like they do for paper. The request is routed to a queue in Aeon that I monitor daily. After some communication with the researcher, I upload a copy of the files to a Google Drive account and share them with the researcher. The request is changed to “checked out” in Aeon. The researcher has two weeks to view the files. After that, I delete the files from Drive and mark the request finished in Aeon. In the first iteration of this process, we used Google Drive like a virtual reading room. Permissions were set to view-only and files could not be downloaded or printed. We started with this strategy to address concerns at our library about properly protecting copyright. It worked well for researchers who needed basic access to files but limited the functionality of some file formats (i.e. spreadsheets were frozen as tables) and did not allow researchers to save search results or integrate what they were finding with copies obtained from other institutions. Photographs from Davison Papers shared with a patron. This year, we developed a policy to allow digital cameras in our reading room. During those conversations, we decided that providing copies of born-digital archival materials for personal research use would be permissible under the same fair-use provision of copyright law that allows the cameras. So now, the researcher signs a form agreeing to abide by copyright law and our policies, and then I provide full access to the files via Google Drive, including allowing downloads. We are happy with this process, at least for now. Ultimately, I would like a system that can pull from our access copies storage automatically and offer researchers tools for viewing and analysis. 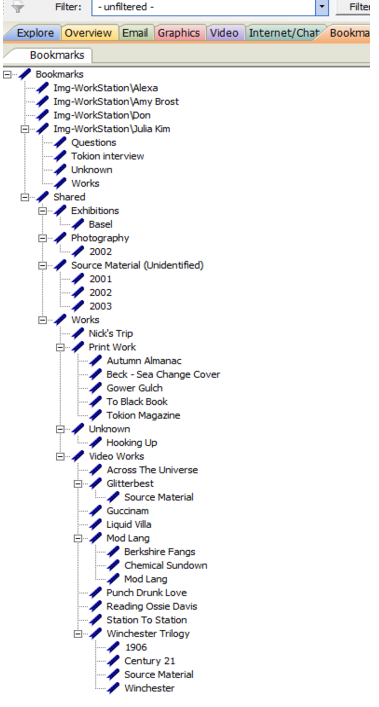 But while we are working on that, this workflow lets us provide reasonable access to everything in our holdings. Adriane Hanson is Digital Curation and Processing Archivist at the Richard B. Russell Library for Political Research and Studies at the University of Georgia, a position she has held for 3 years. She can be reached at ahanson [at] uga [dot] edu. This post is the fifth in a bloggERS series about access to born-digital materials. At the 2015 SAA conference in Cleveland, the Agile for Access Hackfest Team focused on creating a collaborative project that introduces agile development principles as a strategy for overcoming obstacles to born-digital access. 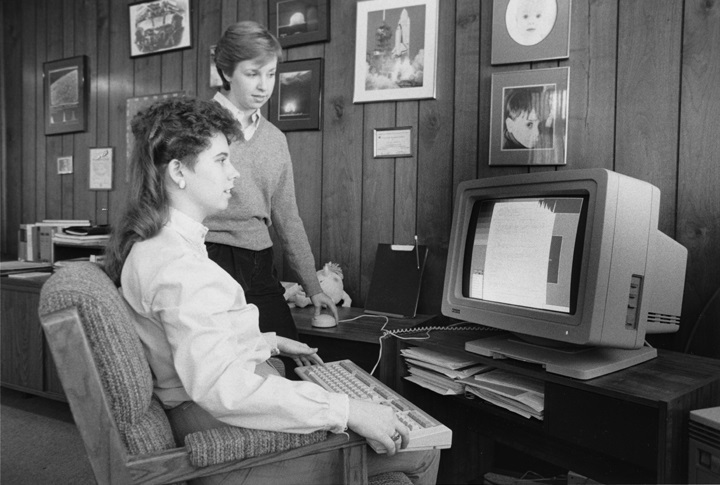 To start the discussion, the Born-Digital Access Research Team provided a baseline understanding of agile and its growth in popularity throughout the 1990s. The Manifesto for Agile Software Development, written and published in 2001, emphasizes “individuals and interactions,” “working software” (working solutions), “customer collaboration,” and “responding to change.” In its most abstract and broadly applicable form, agile shares many of the basic tenets of design thinking or design research: empowerment, collaboration, rapid/frequent iterations, and continual planning, in place of one monolithic plan executed from start to finish. Our Hackfest Team consisted of a mix of archivists from different levels of experience and exposure to agile development principles, so one focus of our discussion was how to communicate what agile is and how to apply it in an archival setting. Erin Faulder (Archivist for Digital Collection at Tufts University) volunteered to serve the group as our fearless Hackfest Team Leader, a role responsible for leading the discussion during the in-session activity and working with research team members to complete the proposal during Phase II. Sarah Bost, (Student Success Archivist at the University of Arkansas) and Amy Wickner (Digital Projects Graduate Assistant at the University of Maryland) graciously volunteered to take notes and record observations, which were later compiled into the first draft of the proposal. You’re invited to view and comment on the full project proposal here. Reflecting on my own participation in Phases I and II of the Born-Digital Access Hackfest, I felt that even though it was challenging to balance Phase II participation against other professional commitments, the Hackfest model proved to be an effective way to incubate collaboration–providing a well-defined structure in which Hackfest team members could explore strategies and exchange ideas. We are looking for a project team to develop this Agile for Access proposal. This project team will be responsible for developing/designing the agile toolkit; identifying possible hosts/distribution platforms; documenting audience use cases that may correspond to toolkit modules (agile for administration, agile for processing archivists, etc. ); designing a project sustainability plan; locating funding sources; and promoting the project. At this time, we are seeking volunteers for the project team, as well as feedback on all aspects of the proposal. We are in the beginning stages of this project and want it to accurately assess the needs of the community to provide access to born-digital materials. Please feel welcome to send comments, ideas, and questions to the Agile for Access Hackfest Team Leader, Erin Faulder (erin.faulder [at] tufts [dot] edu), and Researcher, Jessica Meyerson (j.meyerson [at] austin [dot] utexas [dot] edu). Many thanks to Agile for Access Hackfest Team member Martin Gengenbach for his contributions to this post. Jessica Meyerson is the Digital Archivist at the Dolph Briscoe Center for American History at the University of Texas at Austin, focused on research-in-practice and building community infrastructure to support long-term access of digital material on and off campus. Meyerson currently serves as steering committee member for Texas Archival Reseources Online and co-investigator on the IMLS-funded Software Preservation Network project. This post is the third in a bloggERS series about access to born-digital materials. Over the last three years, the Special Collections Research Center (SCRC) at NCSU Libraries has undertaken an initiative to enhance our capacity for managing born-digital archival materials. For two years, the initiative was staffed half-time by a Libraries’ Fellow and guided by an advisory group representing the department’s core functional areas, with input from colleagues in our Digital Library Initiatives (DLI) department. The initiative has been focused on a set of minimally viable tools and workflows for ingest, processing, and access. For ingest, we’re using a combination of tools, like FTK Imager, BitCurator, and FITS; for access, we are providing access to materials, in most cases, on a laptop in the SCRC’s reading room. For processing, we decided that we did not want to dedicate time and money to arranging folders and files below the object, be it a floppy, optical media, hard drive, or set of files. In ArchivesSpace, we create an archival object record in the appropriate series in which files on media belong; the archival object is given a title as descriptive as possible, based, in part, on information found on the object itself. If an appropriate existing series does not exist, we create it. However, if the media contains content that fits into more than one series, we create a new series, “Electronic Media,” in which the record for the media object will go. The decision not to rearrange files has numerous advantages, including saving staff time, maintaining data authenticity, and allowing users to see the environment in which the creator worked. Most compelling is the fact that we have access to all sorts of metadata about files and their computing environment that we can leverage to make materials discoverable by researchers and to provide them with the resources necessary to do their own arrangement. So, what can be done with this metadata? 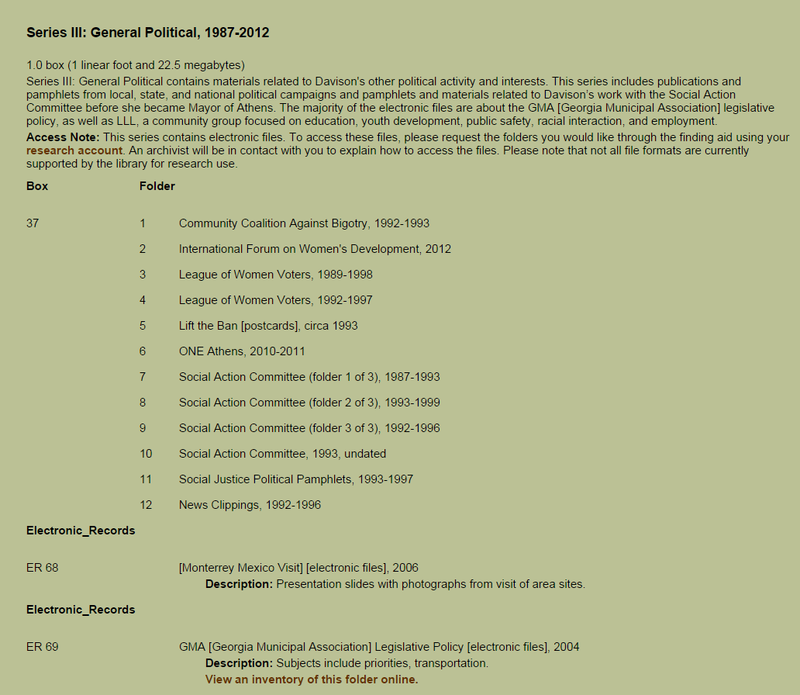 One thing is to combine it into a CSV file that is available for download via our finding aids. There is real potential benefit to the researcher in offering her the ability to do her own arrangement, through sorting by file path, date, document type, or other criteria she sees that might give sense and order to materials. 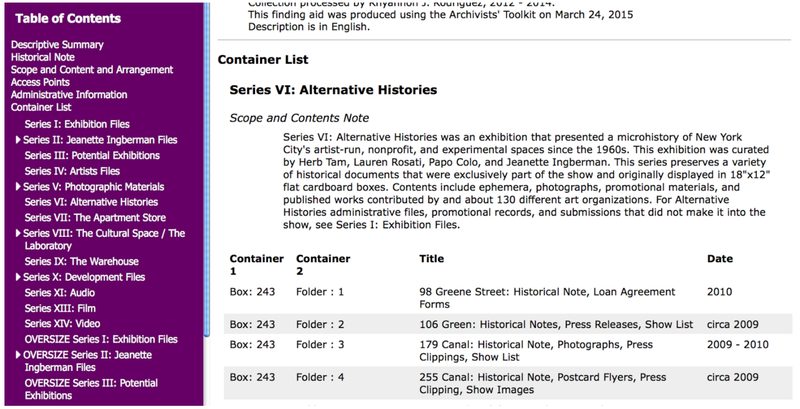 With staff in DLI, we are developing this feature in our finding aids. Another tool we’re developing to help researchers explore the contents of electronic media is a virtual filesystem browser. Using the file and system metadata gathered during ingest, it recreates a file browsing environment—like Explorer (Windows), Finder (Mac), or Nautilus (Ubuntu)—in a web browser, allowing a researcher, from within the context of a finding aid, to navigate virtually the contents of a media object or a set of folders and files. At the file level, there is additional file metadata available for the researcher to consider. Directories and files in “My Documents,” viewed through the filesystem browser. File representation, with metadata, viewed through the filesystem browser. We currently do not plan to provide researchers with access to files through the filesystem browser (we are exploring tiers of access, from restricted to unmediated web access, and the filesystem browser will likely have a role in access). Still, it will allow researchers to get a sense of what kinds of content may be on a disk—which may inform their decisions regarding requests for access—without the expense of symbolically arranging folders or files and tracking that work. Leveraging this metadata for description and resource discovery initially seemed like a minimally viable product, but, as we go along, I think we’ll find that it’s much better than that. Linda Sellars and Trevor Thornton provided insightful suggestions and edits for this post. Brian Dietz is the Digital Program Librarian for Special Collections at NCSU Libraries, where he manages digitization, born-digital processing, and web and social media archiving. NPR: Will Future Historians Consider These Days The Digital Dark Ages? Nice article from NPR on digital preservation with some thoughtful comments by our colleagues in archives and museums. We are awash in a sea of information, but how to historians sift through the mountain of data? In the future, computer programs will be unreadable, and therefore worthless, to historians. Additional discussions on Bert Lyons Twitter feed regarding this article. This post is the second in a bloggERS series about access to born-digital materials. At the 2015 SAA conference in Cleveland, I participated in a born-digital hackfest along with about 50 other people, with the purpose of developing proposals for collaborative projects that would help address current obstacles to born-digital access in the following areas: Advocacy for Access, Understanding Users for Access, Agile for Access, and an Archivist Bootcamp. My group was assigned the task of putting together a proposal for a hands-on Archivist Bootcamp for Born-Digital Access that would train attendees to provide access to born-digital content. Our group discussed a variety of topics, including the growing need to provide access to born-digital material, how to design a bootcamp for an audience with differing skill levels, topics to be included in the bootcamp, other similar existing programs, and the pros and cons of an in-person bootcamp. Although the bootcamp itself is designed to be a hands-on two-day experience, additional infrastructure will be needed to ensure the viability of the training. A centralized wiki, in conjunction with online forums with a specific focus on accessing born-digital material, will provide information to bootcamp participants prior to attending and will also serve the wider community as a resource in its own right. Information added to the wiki and forums will inform the curriculum of the bootcamp. New information and ideas uncovered during bootcamp sessions will bolster the online tools, which could eventually develop into something like a virtual bootcamp or ongoing webinar series. In other words, the bootcamp and online infrastructure would help sustain each other. There is still a lot of work to do. Most importantly, we need to put together a project team. This will include 5-10 people to develop/design the bootcamp and identify possible instructors, funding sources, and spaces to hold the bootcamps. At this time, we are seeking volunteers for the project team, as well as feedback on all aspects of the proposal. We are in the beginning stages of this project and want it to accurately assess the needs of the community to provide access to born digital materials. Please feel welcome to send comments, ideas, and questions to the Born-Digital Access Hackfest Team Leader, Daniel Johnson (daniel-h-johnson [at] uiowa [dot] edu), and Researcher, Alison Clemens (alison.clemens [at] yale [dot] edu). Daniel Johnson is the Digital Preservation Librarian at The University of Iowa focusing on the long-term preservation of digital and born-digital material. Previously Johnson worked as a project archivist at Brown University running a CLIR grant to process The Gordon Hall and Grace Hoag Collection of Dissenting and Extremist Printed Propaganda and as a digital archivist at The HistoryMakers African American Video Oral History Archive.